Black Friday has come and gone, and you’ve probably not even had a chance to catch your breath. But it’s time to take what you’ve learned about your Black Friday email subject lines, and apply it to the rest of the holiday season. In this article, I’m going to tackle how to write the perfect Christmas email subject lines to get your emails opened, clicked, and converted. Are you ready to boost your Christmas email game? Just because you perfected your Black Friday email subject lines doesn’t mean you need to start from scratch for Christmas. While Black Friday is the highlight of the holiday shopping season, you can pack an extra punch by using much of the same powerful words that worked for Black Friday in your Christmas email subject lines. The best words to use are ones you can directly apply to your Christmas email subject lines like “holiday” which had the highest click through rate in the top list, and “free” which also proved successful. “Free” is always a popular choice- and the open and click through rates from our Black Friday data. While it’s not the strongest (by a tiny margin) in open rate, the click through rate is fantastic. “Holiday” is also an extremely popular choice, coming in at the highest open rate. While the click through rate is the lowest among the top five, seasoned email marketers know that a 3.2% CTR is nothing to cast off. 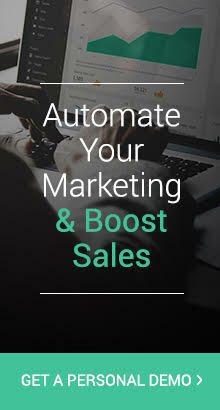 Finally, “sale” is always a winner, even with a slightly lower open rate, the word boosts click through rate to 4.7%. While Black Friday and Cyber Monday may be over, there are three higher performing words on this list that fit really well into your Christmas email subject lines. Holiday Shipping Free Through This Weekend! Christmas Sale: Buy One Get One Free! Today only: Post-Black Friday Sale- Get 70% Off! Over the years, we marketers have used a slew of words to talk about Christmas. Sometimes we shorten it to “x-mas,” sometimes we use the all-inclusive “Happy Holidays.” We also love to nitpick over which words, tones, and punctuation would be absolutely perfect to make that sale. Your email subject lines are no different- which of the three is best to use? 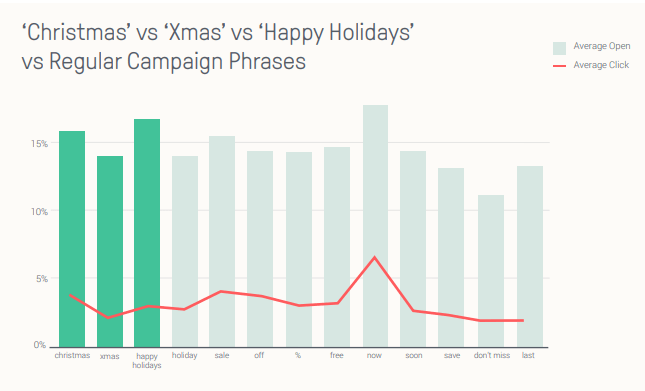 “Happy Holidays” still performs well in terms of open rate, but click through rate drops. Using “Christmas” works the best for click through rate, even with a slightly lower open rate. Of the three, “x-mas” performs the worst, but still does relatively well. 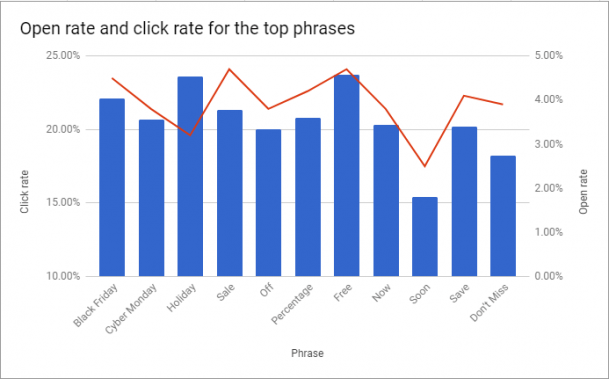 The best performing email subject lines of the “Merry Christmas” variety had some insane open and click through rates. At a 55% open rate and a nearly 30% CTR, it’s definitely worth a try. As we can see, simply subbing out “Christmas” for “Xmas” drops open and click through rate considerably. But how does “Holiday” perform? While CTR ultimately depends on the content of the email, your subject lines also influence a customer’s decision to go to your store. However, email subject lines shine the most when they can get that initial open. What we can see here is that both “Holiday” and “Christmas” leave “Xmas” in the dust, with “Christmas” performing the best in both open and click through rates. However, regardless of how our subject lines perform, you should use what works best for your customers. Like I mentioned before, you should always do what’s best for your customers. 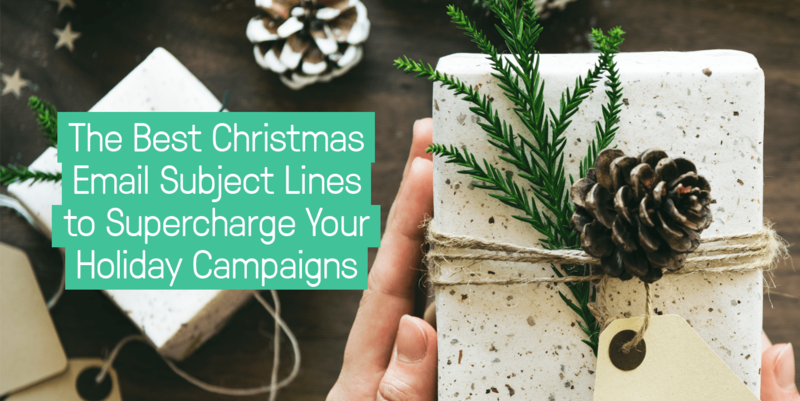 When you study your own Christmas email subject lines, you can write the best ones for your open and click through rates. What are your best Christmas email subject lines? Let us know below! Content Marketing Manager for Omnisend. 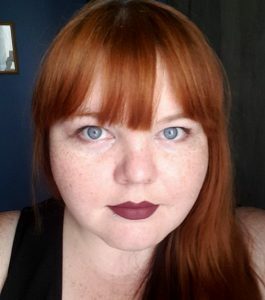 When not writing awesome content, Whitney is reading up on the latest in digital marketing, ecommerce, and social media trends. Obsessed with pop culture, art, and metal. Powered by coffee. Fastest Googler in the West. Follow on Twitter.